We will explore seven ways that a business benefits by having commercial awnings installed on their property. In business, the return on investment is important. Metro Awnings & Iron understands this principle. We have a list of seven ways that business directly benefits by having awnings and canopies installed on their property. Recent years have seen a significant improvement in the quality and durability of awning and canopy fabrics. Not too long ago, outdoor awnings were something that faded and weathered in only a couple of years. When a property did not want a ‘tired’ curb appeal, awnings needed frequent repair and replacement. Modern outdoor awnings should not need a replacement for at least a decade. Thanks to updated fabric options from companies like Sunbrella, awning fabrics will have 10-year warranties against UV fading and weathering. Awnings add visual and curb appeal to properties. With the recent improvements in fabric durability also comes a much larger selection of colors and patterns to choose from. Another big visual improvement is having colors that are embedded in the fabric itself to improve fabric longevity. Finally, awning and canopy fabrics that visually compliment a structure and will not fade after a couple of years. Many businesses depend on maximizing profit by square foot from their property. Adding custom outdoor awnings and canopies will provide extra footage for retail displays, customer seating, merchandise, and information kiosks. Adding awnings and canopies on windows and doors will add energy efficiency to a property. By adding UV resistant awnings and canopies, interior spaces will stay cooler and reduce the workload of HVAC systems. Less light entering a property equals direct savings in daily operating costs. In Southern Nevada, a business owner quickly learns how quickly the desert sun can adversely affect property interiors and furnishings. Curtains, blinds, flooring, equipment, and furniture alike can quickly fade, dry out, and rot when exposed to harsh UV light. Installing window awnings can reduce UV exposure and add years of longevity to property and materials. Speaking of modern awning and canopy fabrics, advertising a business or brand has never been easier! 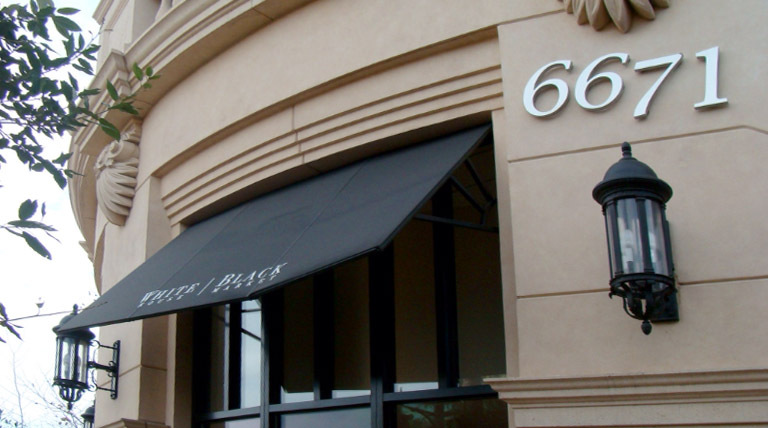 Quality awnings can be used as the perfect branding tool for business names, logos, and brands. With so many fabric colors, patterns, and textures available, now has never been a better time to harness the visual marketing power from an awning or canopy. Last but certainly not least, having awnings and canopies installed provides comfort, shade, and weather protection to business customers and employees. Southern Nevada at any season can experience harsh UV rays, wind, and rain. The addition of custom awnings and canopies can greatly improve the experience for customers and employees alike. There has never been a better time to capitalize on a great opportunity and talk with the experts at Metro Awnings & Iron in Las Vegas, Nevada about what they can do for your business. Call us at (702) 795-7787. The Merriam-Webster Dictionary defines the term Upholstery as: “materials (such as fabric, padding, and springs) used to make a soft covering especially for a seat”. Traditional upholstery uses materials like a cow, horse, and hog hair, straw, wadding, linen scrims, and leather. Modern upholstery utilizes synthetic materials like Dacron and vinyl which add to the longevity of the fabric. Upholstery fabric should be suited for the use and durable enough to handle the functionality needed. A material that easily rips or tears will not make a good upholstery for a couch. A fabric that cannot repel water will not make a good upholstery for an outdoor canopy in an area that gets a lot of rain. A material that is not suited for UV light rays will quickly fade when exposed to sunlight. Knowing what fabrics to use for what purpose is a big part of what professional upholsterers understand. The upholstery that works perfectly for a shade-sail might not be right to apply for a pillowcase. The fabric used for a custom outdoor awning may not look or feel right when used as a seat cover. Knowing when and were to use an upholstery fabric is where having an expert comes in handy. Metro Awnings & Iron in Las Vegas, Nevada takes the guesswork out of upholstery fabric for their custom awnings, shade sails, canopies, and shade structures by using professional grade Sunbrella fabrics. The reasons for using Sunbrella fabrics are easy to understand. We will now discuss some of the more prominent reasons for using Sunbrella in our custom shade solutions. Sun Protection – Sunbrella shade fabrics are high in UPF protection. Sunbrella fabrics are the only brand recommended by The Skin Cancer Foundation as an aid in the prevention of sun-induced damage to the skin. UV and Fade Resistant – Sunbrella fibers are saturated with highly UV stable pigments. Traditional dyeing methods only add color to the fiber exterior. Sunbrella fabrics’ performance characteristics are an integral part of the fabric, not an applied finish that would wash off over time. Mold and Mildew Resistant – Sunbrella fabrics inherently resist the growth of mold and mildew. To keep your fabrics looking clean, brush off dirt and debris before it gets embedded in the material. Bleach Cleanable – To easily remove tough stains, simply clean Sunbrella fabrics with a bleach solution. Because the color goes to the core of the fiber, the fabrics will not lose their color. Breathable Fabric – Sunbrella shade fabrics are breathable and allow air to pass through them, creating a comfortable space below. 10-Year Warranty – Sunbrella fabrics are the industry leaders with their 10-year warranty against fading and weathering. MADE IN THE USA! What more can we say?! What is a poolside cabana? Cabana comes from the Spanish word cabaña, with its Late Latin root capana, which is a hut, cabin, or tent structure. Unlike a gazebo which is open on all sides of the structure, cabanas have covered sides. Poolside Cabanas are small, sometimes movable structures usually found near water and used for shade and privacy while poolside or beachside. Each side panels of a cabana are like a curtain and extended and retracted to adjust the amount of privacy and shade needed. The roof of a cabana typically has all-weather fabric that will stand up to UV rays, wind, and weather. Traditionally, a cabana is a tent-like structure that can be moved around from one spot to another on the beach. It can act as a mobile dressing room, where swimmers can dry off and put their clothes on. People also use the word cabana to describe any poolside building or changing room. In Las Vegas, poolside Cabanas are at many casino resorts poolside. The cabanas found at these hotels will typically fit multiple people and offer several amenities like HD TVs, food and drink service, and water misters to help beat the heat. Private parties, naps, changing in and out of swimwear, staying out of the sun, enjoying some privacy are some of the best reasons to enjoy a poolside cabana. Not only will you see cabanas on the Las Vegas Strip, many housing complexes and private residences also have cabanas. People often enjoy cabanas at public pools when they need shade or privacy. These structures come in many sizes, shapes, colors, and materials. Cabana roofs can be constructed from outdoor fabric, wood, metal, thatch, and even palm leaves when you want a tropical look. A curtained cabana makes a casual place in a backyard in which to escape or even a lovely romantic retreat. Now that summer is on the way, what better time to call Metro Awnings & Iron for your custom cabana consultation. Call Metro Awnings & Iron at (702) 795-7787 and schedule your consultation today. We are located at 4525 W Hacienda Ave, Las Vegas, NV 89118. You may not recognize our company by name, but if you have been around the Las Vegas area, you have likely seen our custom awnings, cabanas, shade sails, and shade structures all across the valley. What you may also not know is that Metro Awnings & Iron of Las Vegas, Nevada is proud to say that our materials are produced right here in town! That’s right! We are a 100% Made In The USA company! Metro Awnings & Iron, Inc has been building and installing Window Awnings, Pool Cabanas, and Shade Structures for over 25 years. We offer quality craftsmanship and top customer service. Metro Awnings & Iron has strong family values and we will make you feel part of our family. When you talk with our company, you talk to the owners/operators of the business, not some guy who doesn’t care about the work after he has taken your money. Our company offers a 100% Satisfaction Guarantee to back it up! Metro Awnings & Iron has manufactured and installed custom awnings, canopies, shade structures, and custom iron work all around Southern Nevada. Some of our more prominent commercial projects can be found at The Cromwell, Circus Circus, 90 Ninety Bar + Grill, and many other locations in the area. If you have been poolside on The Strip, you have likely seen some of our custom cabanas up close. Our company also provides custom shade solutions to private residences and housing developments. Metro Awnings & Iron, Inc would like to take this opportunity to ask you to please help and support our state & country by buying products made in the USA and services here in Las Vegas, NV USA. We have been in the custom awning business for 25 years, and our products are proven to last!